NTSB Investigator Robert Accetta documents the damage to the motorcoach. On the evening of April 10, 2014, dozens of injured high-school students struggled to exit a burning motorcoach after it was struck head on by a truck-tractor pulling two trailers in Orland, California. Their vision was impaired by thick smoke, and many hesitated to jump from the emergency windows that were more than 7 feet above ground. These students had not received a pre-trip safety briefing explaining emergency egress or the importance of using seat belts. There were no printed safety cards for them to consult. No emergency exit lighting guided them. The heavy emergency exit windows were a challenge to stay open long enough for students to escape through them. To make matters worse, the motorcoach interior materials were not designed to resist such a major fire, so the fire and toxic fumes spread rapidly. If these students had been passengers on an airline, they would not have experienced the same egress problems. The interior of their plane would have been built with fire-resistant materials capable of resisting a major fire. They would have been given a safety briefing and would have had access to printed safety instructions. They would have been guided by independently powered emergency exit lighting (floor lighting below the smoke) and special emergency exit signage. Five students died as a result of the fire and the crash that had led to it. So did their three adult chaperones, their driver, and the driver of the truck-tractor that struck the motorcoach. The National Transportation Safety Board was created to determine what causes crashes such as this one and then to make recommendations which, if acted on, will help prevent recurrences of those tragedies. On July 14, we met to discuss this crash and fire. 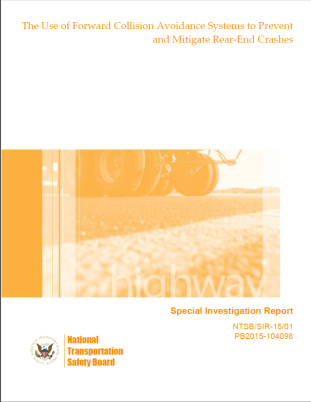 As a result of our investigation, we made recommendations to the National Highway Traffic Safety Administration (NHTSA) and to the Federal Motor Carrier Safety Administration (FMCSA). We also reiterated recommendations that we had previously made to NHTSA—some of which date back to 1999 and 2000—that have not yet been acted upon. In large part, as a result of NTSB aviation accident investigations and recommendations, air travel has become exceptionally safe. But standards of occupant protection in other transportation modes, especially highway, have lagged behind. Many of the recommendations we issued or reiterated as a result of this crash, if acted upon, will give motorcoach passengers a level of safety protection comparable to that of a passenger traveling by air. We also addressed the absence of event recorders that can help us determine why a crash occurred. In aviation, cockpit voice recorders and flight data recorders have been required for decades. The data yielded from these systems have helped the industry move toward safer operations. But in highway transportation, event data recorders are still not required equipment on either truck-tractors or buses. We know from witness statements and physical evidence that the truck-tractor was traveling southbound in the right lane on Interstate-5. It moved into the left lane, crossed a 58-foot-wide median, and emerged going the wrong way in the northbound lanes. There it struck a passenger car, sending it spinning off the highway to the east, and then it crashed into the motorcoach. We were not able to determine why the truck crossed over the median. If the truck-tractor had been equipped with an event data recorder, we might have learned more about why it departed its lane and caused this crash. In U.S. aviation today, years can sometimes pass between fatal crashes of scheduled commercial flights. Moreover, when such crashes are survivable, the vast majority of passengers are able to exit. When Asiana Airlines flight 214 crashed in San Francisco on July 6, 2013, impact forces were catastrophic. Yet 99 percent of the 307 occupants survived. Ninety-eight percent of the passengers were able to self-evacuate. The Orland crash was a tragedy, but it can also be a turning point. 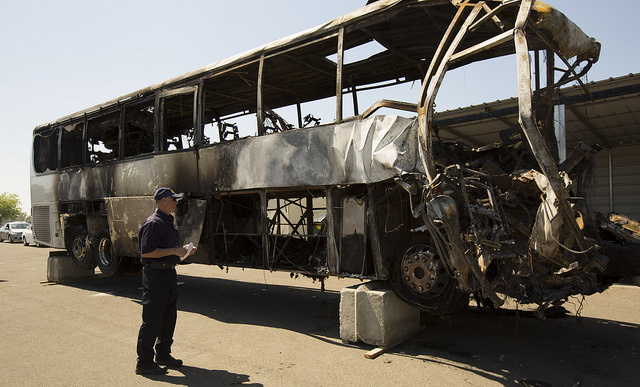 Standards of safety in highway vehicle fire-resistant design, emergency lighting, and emergency instructions can improve, if regulators take action. We urge NHTSA and the FMCSA to move forward on our new recommendations, and for NHTSA to act on the recommendations that we reiterated. By doing so, many such crashes could be prevented in the future. Earlier this summer, I was delighted to sail a cargo ship into the Port of Baltimore. Well, it was actually in the MITAGS Class A ship handling simulator, but it was thrilling and informative, nonetheless. The Maritime Institute of Technology & Graduate Studies (MITAGS) is a non-profit training center for mariners and a center for maritime research. NTSB Office of Marine Safety Director Tracy Murrell assisted me as I safely sailed the cargo ship carrying a full load past the correct buoys, despite the (simulated) rough waters, a nearby vessel fire, and rain and snow. Although Executive Director Glen Paine, Training Director Eric Friend, and their colleagues enjoyed putting us to the test, they were also showing us the simulator’s high-fidelity graphics and realistic ship behavior. 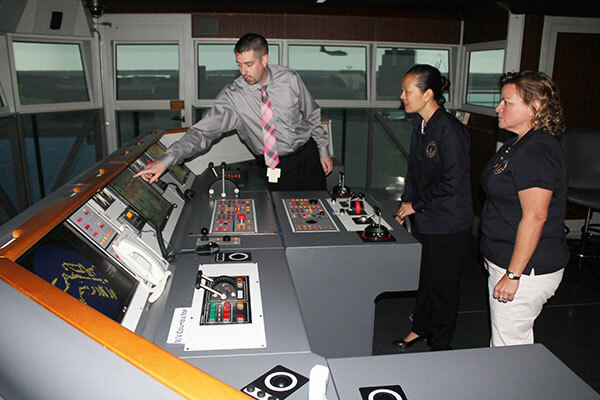 The simulator enables the MITAGS to conduct its hands-on training programs and ship and port modeling studies. With accurate navigational technology in front of me and screens several stories high depicting the outside waters and port, I felt like I was in an actual bridge of a ship. I also came away with an even greater appreciation for the complex tasks that pilots and ships officers must perform when responsible for the safe navigation of a vessel. Mariners must be vigilant about safety at all times, and training is vital for mariners of all types—whether a seaman or an unlimited tonnage master or pilot—to prevent both personal injuries and environmental damage. The MITAGS develops and delivers maritime training and education programs to do just that. In addition to using the simulator, we had the opportunity to hear about the many classes offered, such as limited license training, marine safety/emergency response training, and chief mate/master management programs—over 120 classes in all. The MITAGS is the primary training center for the International Organization of Masters, Mates, and Pilots, and companies use the resources at the center for research studies, as well. The MITAGS is located near Baltimore, and the associated Pacific Maritime Institute (PMI) is in Seattle. Whether we travel by boat or ferry or we consume goods transported by cargo ships similar to the one I navigated in the simulator, marine safety has long been an important part of our nation’s health and welfare. Marine safety is a key aspect of the NTSB’s work to advance transportation safety, and I was happy to learn about how the MITAGS is contributing to safety through its training and research efforts. Dr. T. Bella Dinh-Zarr is Vice Chairman of the National Transportation Safety Board. Last week, host Mark Willis of Road Dog Trucking News interviewed me about a recent NTSB report on collision avoidance systems (CAS). He wanted to share with his listeners the benefits of technology that not only warns a driver of an imminent crash into something ahead, but also stops the vehicle if the driver doesn’t. The show’s call-in format gave me the opportunity to talk directly to truck drivers who would benefit from this technology—and to listen to them as well. (The host frequently reminded drivers not to call in while driving.) It was a conversation with an audience whose business is on the highway, hour after hour, week after week, and whose business is crucial to our country’s economy. Without a doubt, commercial truck drivers are aware that heavy trucks require longer stopping distances. That is why collision mitigation can be so beneficial for commercial vehicles. For trucks, a complete CAS includes collision warning, which warns drivers about an imminent obstacle ahead, and autonomous emergency braking (AEB) to stop the truck if the driver does not heed the warning. The NTSB released its special investigation report, titled “The Use of Forward Collision Avoidance Systems to Prevent and Mitigate Rear-End Crashes” in early June. Some skeptical callers said that AEB would destabilize the vehicle by stopping it abruptly. That concern is why our June report recognized that AEB should be paired with electronic stability control (ESC), something that many commercial trucking fleets recognize. ESC would be essential, as it would prevent jack-knifing and loss of control during AEB applications. Last month, following our report, the National Highway Traffic Safety Administration (NHTSA) issued a final ruling mandating ESC on every new truck tractor weighing 26,000 pounds or more within the next four years. The commercial vehicle industry estimates that about 10 percent of new truck-tractors are already equipped with collision warning and AEB systems. Some companies are already transitioning their fleets to CAS-equipped truck-tractors, not only to improve safety and save lives, but also to save money (e.g., workers comp and numerous other costs resulting from a crash). The NTSB has been pushing for crash mitigation technology for commercial vehicles for two decades. We issued our first recommendations on testing these technologies in 1995. In 2001, we urged NHTSA to develop adaptive cruise control and collision warning system performance standards, and then to use those standards to mandate standard collision warning on all new commercial vehicles. NHTSA has yet to satisfy these recommendations, although its new ESC rule is a good and necessary first step. The recommendations we released in our latest report would help bring CAS technology to members of the Road Dog audience. The NTSB called for truck-tractor and single-unit truck manufacturers to immediately install, at a minimum, the collision warning component of CAS. Further, we asked manufacturers to add AEB systems once NHTSA completes performance standards for those systems. Along with our 2015 report, we issued a safety alert to fleet owners and consumers of passenger vehicles. This alert advises purchasers about the safety benefits of CAS, and urges them to request vehicles with AEB and collision warning. And if truckers don’t see CAS in their trucks, they should ask their companies for it because their lives and the lives of the traveling public could depend on it. Christopher Hart is Chairman of the National Transportation Safety Board. Vice Chairman Dinh-Zarr addressed teen leaders on transportation safety as a public health issue at the Family, Career and Community Leaders of America (FCCLA) Leadership Seventy Years Strong Rally on the National Mall. 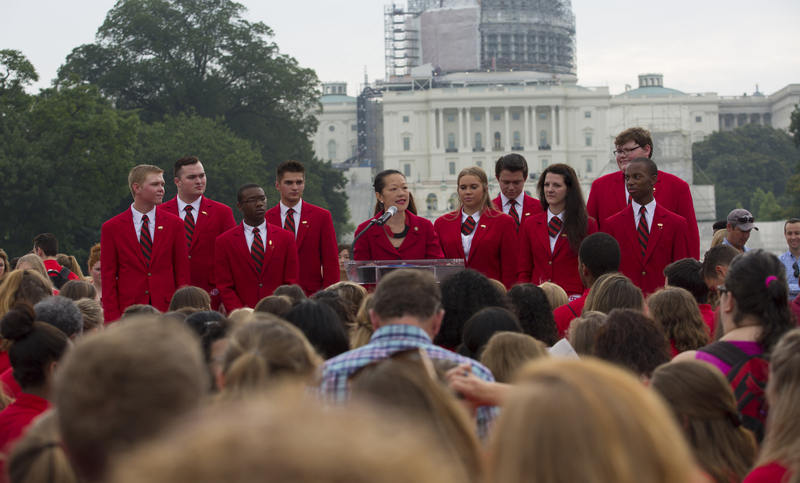 Today, I stood side-by-side with more than 5,000 students and educators from around the country to celebrate the 70th anniversary of the Family, Community and Career Leaders of America (FCCLA). We cheered, chanted, and danced at a rally on the National Mall in Washington, DC, to show our support for this organization, which has made a difference in our communities by helping to shape future leaders. FCCLA is a nonprofit national career and technical student organization for young men and women in Family and Consumer Sciences education through grade 12. I was delighted to join them today to inspire and be inspired by some of our nation’s youngest leaders—who will ultimately help change the culture of public health and highway safety. As the first public health scientist appointed to the NTSB, it was especially exciting to speak on behalf of the NTSB about prevention—using the knowledge we learn from tragedies to prevent future crashes. Youth highway safety has long been a concern for the NTSB and for me personally. The concerns we face in preventing injuries and fatalities on our roads are becoming a public health issue, “an epidemic on wheels,” and I wanted to share that message with the FCCLA youth. More young people die in crashes every year than from any other cause. In fact, more than 50,000 young people have died on our roads in the last decade. Transportation safety should be important in everyone’s life. I walk or bike and use the metro each day as I travel to and from work. Maybe, like me, you took public transportation to work this morning. Or maybe you drove your children to camp, you went boating for the holiday weekend, or you plan to fly for your annual family vacation. Whatever the case, our health depends on safe transportation. And safe transportation depends on us. When I was a junior in high school, about the same age as some of the FCCLA youth I met today, I decided to spend a summer volunteering to build latrines in Paraguay. While I was walking along a dirt road with some of the elementary school kids from our village, we had to jump aside as large vehicles roared past. That is when I began to realize the importance of safe transportation. Today’s youth have an important role in changing our driving habits and how we see our health. Leaders like those at the rally have a huge voice and one that they should continue to use to speak up for safety. They’re the most connected generation ever. They are connected to the whole world and can spread the message about road safety like no other generation has. We all must do our part— hold each other accountable, set good examples, and speak out to policymakers about the importance of safe roads for everyone. FCCLA’s theme speaks to a well-established truth: Together We Are Healthy. Together, we can encourage each other to make healthy choices as individuals, and together, we also can advocate for healthy policies. Together, we must bring awareness to the public health issue of transportation safety by changing our safety culture. I am confident that these young people will go far and make our communities, our nation, and our world a safer, healthier, and better place. Happy 70th Anniversary, FCCLA! As boaters of all kinds and types crowd the waterways this Fourth of July to observe the night’s fireworks spectacle, keep in mind the other boaters around you. America’s waterways—which include commercially navigable ocean, coastal, and inland waters—have become increasingly more crowded over the past several decades. With commercial shipments of passengers and goods, recreational motorboats, personal watercraft, kayaks, and paddleboards all sharing our nation’s waterways, this growth in traffic presents challenges to the safe operation of all. This will be no more evident than on the Fourth of July, where, for example, in the Chesapeake Bay off the coast of Maryland you could find both motorboat and cargo ship sitting side by side waiting for the familiar boom and clap of fireworks off the shoreline. Dangerously close encounters between commercial vessels and recreational craft on shared waterways are becoming all too frequent. In fact, the US Coast Guard reports that, in 2014, seven people were killed and nine others were injured in 18 accidents involving a recreational craft and a commercial vessel. Wear a life jacket at all times. Putting on a life jacket when you’re in the water is too late! Don’t operate a vessel while impaired. Boating Under the Influence (BUI) continues to be leading contributor of fatal boating accidents. Maintain safe boating speeds and observe “No Wake” zones. Always have a designated lookout in place. If you are using a kayak, canoe, paddleboard, or other human-powered watercraft, stay close to the shore, wear high visibility clothing, and travel in a single file at all times. If you are operating a personal watercraft, avoid shipping channels, and stay clear of ships, water taxis, and commercial tugs and barges. Tracy Murrell is the Director of the NTSB Office of Marine Safety. Millions of Americans celebrate Independence Day every year, with parades, barbecues, and fireworks. But all too often we Americans squander the very rights we celebrate – and deprive others of theirs – when we choose to get behind the wheel impaired. According to the National Highway Traffic Safety Administration, in 2013, more than 500 people were killed in motor vehicle crashes over the Fourth of July holiday (6 p.m. July 3 through 5:59 a.m. July 8). Of those fatalities, nearly 200 occurred in crashes that involved at least one driver or motorcycle operator with a BAC of .08 or higher. During that same time, the rate of alcohol impairment among drivers involved in fatal crashes was more than three times higher at night than during the day. “July 4sight” – plan ahead. If your celebration involves alcohol, take public transportation, designate a sober driver, or call a local cab service to get you safely home. It’s not just your life you’re putting at risk! “Homeland” defense – host like you mean it. If you’re hosting a celebration in your home, make sure that your friends and family are sober before getting behind the wheel. The Constitution says you don’t have to quarter soldiers in your home… but your party guests are your responsibility! “Liberty without Virtue [is] Folly, vice, and madness, without… ” Wear your seatbelt – it’s your single greatest defense against death and injury in the event of a crash. And ensure that everyone in your car is buckled up. Keep your children safe; make sure they are properly restrained using a child safety seat or booster seat. Good government: July 4th crackdown on impaired drivers. 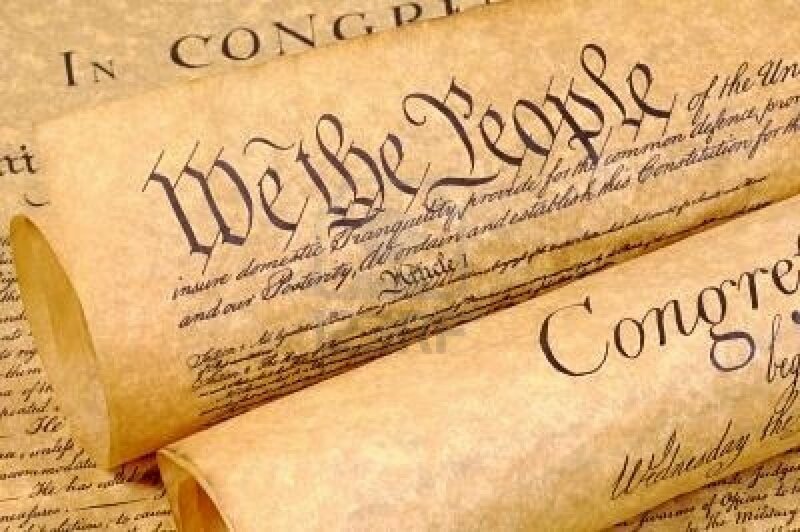 As Thomas Jefferson said, “The care of human life and happiness, and not their destruction, is the first and only object of good government.” This Fourth of July, law enforcement will be out in full force, aggressively targeting those who put human life and happiness in danger by drinking and driving. Don’t be among them. Let’s celebrate this Fourth of July responsibly, and do our part to protect all Americans’ rights on the roads by encouraging others to do the same. 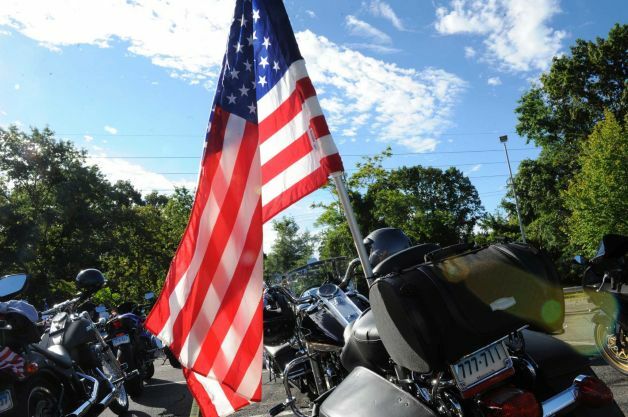 The Fourth of July is coming, and so are motorcycle rallies around the nation—from Fly Our Flag High in Minnesota to the Hollister Independence Day Motorcycle Rally in California. Riding is about freedom; maybe that’s why bike rallies are such a natural fit with the Fourth. As a motorcyclist myself, I know that the feeling of freedom we experience out on the open road needs to be balanced with the good forethought to take smart precautions. Responsibility comes with freedom—or vice versa—and it’s not only responsibility to yourself, but to your family, your friends, and others on the road. So you young motorcyclists, listen up. And you old motorcyclists spread the word. The price we pay for the freedom to ride is not just the cost of the bike – it is the constant attention to safety. I see young riders taking to the streets on bikes like a Kawasaki ZX10R Ninja, Yamaha FJR 1300, or a Harley Davidson V-Rod shortly after passing their motorcycle tests. I wonder whether they know and understand the power and speed of such models. I started off with a Honda 150, moved up to a 250, and finally learned to operate bigger bikes like a 600, 750 or 1000. That longer learning curve gave me a chance to improve my physical and mental skills. At the same time, as I moved up through different models, I learned first-hand the value of proper protective gear. When—not if—you lay that bike down, you need protection between the pavement, the bike, and you. Don’t ride if you’re too tired, and don’t ride while impaired. And that doesn’t just mean alcohol and illicit drugs. Prescription medications and over-the-counter medications could also be sources of impairment. What about “the other guy,” the one in the passenger vehicle who should share the road? Safe riding takes a commitment to protecting yourself, other riders, and motorists. Nicholas Worrell is Chief of the NTSB’s Office of Communications’ Safety Advocacy Division.